Fix too-dark foundation with a lot of blending and a little mixing. While many makeup counters will let you test a foundation before you buy it, you may not have the same opportunity at your local drugstore. Occasionally, the foundation that looked perfect in the store is too dark once you get it home and open the package. Not to worry -- often you can dilute and blend a foundation that's just a little too sun-kissed for your complexion. For an obviously dark foundation, you can play painter and mix a foundation that's perfect for your unique coloring. Mix the foundation with a pea-sized amount of moisturizer and blend into the face and down your neck with your fingers or a sponge. 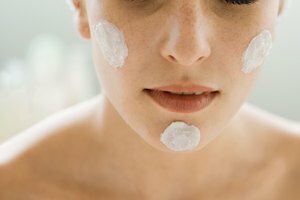 The moisturizer will help dilute the pigment, making it easier to blend into your skin. Blending the foundation down your neck will help you avoid a tell-tale foundation mark and make your skin tone look even. 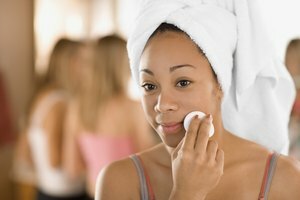 Dampen your sponge before you apply your makeup. The water on the sponge will make the foundation thinner and more sheer, which can help you blend it more seamlessly into your skin. Mix the dark foundation with a foundation that is a shade lighter than your current skin tone to create a perfect match. 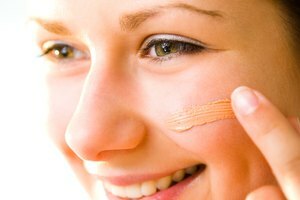 Having a lighter foundation is useful for the winter months, when your skin is at its palest. As you move into spring and summer, you can add more of the dark foundation to the light foundation to match your changing skin. Blend the dark foundation with a sponge to contour your skin. Use it on the hollows of your cheeks, the sides of your nose, at your hairline and around the base of your jawline to give your face more structure and highlight your cheekbones. Set your foundation with a lighter powder. The powder will help even out the dark foundation while minimizing shine and setting your makeup. For very dark foundation, consider buying a white foundation to mix with your makeup. If you mix foundations, make sure they have similar ingredients and consistency. If one foundation is water-based and the other contains oil, you could wind up with a streaky mess. Style Craze: Too Dark Foundation: How To Fix It? Robinson, Lindsey. "How to Blend a Foundation That Is Darker Than Your Natural Color?" Synonym, https://classroom.synonym.com/blend-foundation-darker-natural-color-5617.html. Accessed 21 April 2019.